Is War Coming Between China And Japan? In the last day it has been reported that Chinese forces have been mobilising. February 3, Nan’an, Fujian Highway 308, artillery units practical exercise for several days. 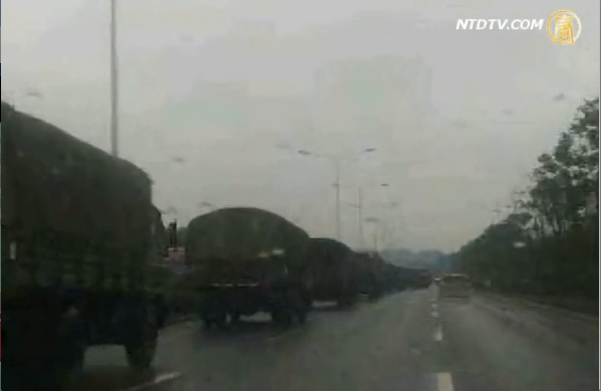 February 3 to 6, Fujian, Xiamen, Zhangzhou, Huzhou, a large troop movements, nearly 100 vehicles of various types of military vehicles, armored vehicles, artillery filled the entire road, endless, Xiamen and even the scene of a traffic jam 10 kilometers. In addition, on February 3 in Shiyan, Hubei, a large number of tanks, wheeled military base from Shiyan room counties is delivered to the coastal areas. Many local residents of the tense situation of some concern. Prior to this allegation, January 15 and 30, the Chinese navy guided missile frigate, twice the fire control radar lock frigates and ship-borne helicopters of the Japanese Maritime Self-Defense Force, is also considered to enter a combat state. According to mainland media quoted the “People’s Daily” front-page article claiming that China will not change in point of view on the issue of the Diaoyu Islands , and have to prepare to win the war. The international media alleged that China has purchased from Russia 239 engine, used in the manufacture of the H-6K. Combat covering the Diaoyu Islands, in this model, the engine can also be used to manufacture transported -20 transport aircraft purchased. If the engine assembled, will greatly enhance China’s military power. This may turn out to be much ado about nothing, propaganda released to make a hullabaloo. With China gradually growing relatively stronger, and the United States and her allies growing relatively weaker, China on the surface may seem to have very little incentive to do much other than wait. But with global economic conditions worsening, and both China and Japan becoming more fierce in their rhetoric, it becomes likelier and likelier that China may choose to project its economic problems outward by starting a hot war. Most importantly, with the United States not committed to materially defend Japan, it appears to me like China may see this as a golden opportunity to impose itself on the region, to humiliate the already overstretched United States, and make a statement by pushing Japan out of the islands, or perhaps even by going postal and invading other Japanese islands or even Taiwan. With the world dependent on goods and components produced and assembled in China, China already has a lot of leverage to push the rest of the world into accepting a Chinese-dominated regional order. Still I would say that by far the most rational course for China is to not start a war. But if China starts, it becomes increasingly likely that the United States will respond. Governments around the globe are advised to remember that while war may increase GDP, and while it may lower unemployment, it destroys an unquantifiably larger amount of real wealth — lives, businesses, physical capital, social capital. This entry was posted in Current Affairs, Politics, War and tagged america, capital misallocation, china, creative destruction, japan, military keynesianism, war. Bookmark the permalink. This could be the war the bankers need. Kind of long video but worth the watch. Neither China nor the US can really afford the war but that has never stopped the banks because it is the tax payer that gets the debt and the bankers that get the profits. You’re placing a great deal of trust in what a peace of paper says. That the US is not legally required to declare war does not mean that it will not declare war. Words on a page are just that. I have read that the people who now govern China are all billionaires, and that the country has a lot of low-level internal trouble and dissent. Present Chinese institutions do not provide channels for the expression of dissidence, so it can be expected to grow. One way to temporarily suppress dissent and get everyone to toe the line for a while is to threaten to start a war. The accompanying military gestures also are useful exercise and advertising for the Chinese military establishment. If this is indeed the situation, a real war will occur only if someone makes a mistake. This is definitely going to benefit defense spending. The US “Pacific pivot” is already n the works, and this will just hurry it up, while the MENA/Iran situation ensures that the US will be preparing for major wars on two fronts for the foreseeable future. The US expansion into Africa is part of this build up, as is the push to develop domestic energy supplies. The military is still a dominant force in US and global economics. Japan has, very arguably, the second most powerful military in the world. Don’t be fooled by the name “Self Defense Force.” The Japanese have been toying with repealing Article 10 (the article that only allows for self defense by thier military) of thier constitution for the last decade and have modified as need be to counter China. Any attempt by China to start a hot war would leave them humiliated at the hands of the Japanese–somethng that they will not bear again. China does not have the troop transport capability by sea or air be successful. Any factor in an invasion needs to take into account the sea state and present weather–now is not optimal. This is China being China–lie until someone believes, and hopefully, it gains momentum so that it eventually becomes truth. Might be. It’s quite a clever stratagem on Japan’s part. Call it “The One stone to hit two birds. Japan can ask the Americans to lead Japan’s WWII veterans and their large group of the geriatric fighters to fight the war. Few young Japanese are interested in fight any war at all. Japan can depend on its elder population to get that done. By doing that, Japan can get rid of their burdensome elderlies. War also create large domestic demands. After the elderlies die in war, their asset and money will go to their young heirs. If they have no heirs, then the money will go into the government’s coffer. Heard many Japanese elderlies have no heirs. So get rid of their elderlies at war and get rid of the debt to support them. Wa… what the great idea. The war will also destabilize and weaken China CCP power and control. But Who’s the bigger market for the US businesses? China or Japan? It’s pretty obvious. But may be the US care less about China market since the US have not much to sell anyway. It might as well destroy the biggest market and then rebuild it to the US taste. Russian fighters flying over Japan.. Chinese ships taunting Japanese coast guards..
that’s what you get when you go nuclear in currency wars. why do they do it now? why not earlier or later? what makes them so bold? do they know USA will be too busy elsewhere? is it positioning for what is to come or perception management? If democracy and freedom of speech are adopted by China will it limit the power of the communist party? I doubt it. Putin was a KGB agent in Soviet Russia. The so called Russian Oligarchs were linked to the communist party and Russian mafia. Every country has to have a hot war, to keep its troops skilled. There is no use of having Generals who have no battle experience. I assume the Generals who fought in the Revolutionary War are about to pass on. The Korean War Generals are nearly there or retired. Vietnam?? I think the Military would be pushing for a hot war, just to keep the Military practically experienced enough to actually defend the country. I agree with Sumtingwong, in that China does not have sea capability as yet, nor air, even with Russian engines.. So China will make all types of noise to maintain face. They are not ready, yet. Because I believe that a battle over the islands in the East China Sea is inevitable, each side has to determine whether it is advantageous for it to delay the battle, or to get it done sooner rather than later. In my estimation, the sooner it starts the better it is for China. Since China must initiate the attack (or provoke Japan into responding to a seizure of the islands), I believe that it will be soon. It is inconceivable that the Chinese populace will allow their leaders to climb down. The rank and file Chinaman has come to believe that the time is now to exact revenge against Japan and the US (which stands as proxy for all the Europeans who participated in China’s humiliation between the Opium War and Marco Polo’s Bridge). Meanwhile, with the election of Abe, the Japanese people are determined to end their decline. Abe’s leadership would end quickly, should he give up title and control of the islands to China. For all the show of naval ship patrols, the real confrontation will be in the air. Logistically, Japan can maintain more air power over the islands than China, because Okinawa is much closer to the Senkaku. But China possesses satellite surveillance capabilities, while Japan must rely on American support for this. If the United States provides real time intelligence and other electronic warfare assets to the Japanese, the Chinese cannot win. If the U.S. acts as the eyes and ears for the Japanese, and disrupts communication and control of the Chinese forces, the next step in escalation would be a Chinese missile attack on Okinawa in order to knock out the airbases at Kadena and Futenma. But US air, naval, and marine assets are all over the island. So this would inevitably trigger a combat response by the U.S. I don’t think that the Chinese want go that far. But once they are in, I expect them to go all in. So both the Chinese and Japanees are trying to determine what the Americans will do or won’t do. In the meantime Japan is endeavoring to acquire the capabilities which hereto fore it has relied upon America to provide. I just finished watching CCTV. Whilst I don’t understand Mandarin, the pictures of military training, and soldiers rolling bear chested in snow to show their strength and endurance, does not bode well. But possibly propaganda to give the Chinese citizens confidence in their abilities. A Chinese attack on Japanese islands will end up like the Falkland Wars in 20C. China has neither the technology nor experience to seize a victory against Japanese navy yet.